Hyaline ring granuloma is an unusual form of chronic granulomatous inflammation towards the implanted foreign particles within the tissues. The oral pulse or hyaline ring granuloma (OPHRG) is frequently encountered while histopathological examination of oral lesions. However, they are not commonly reported and discussed. OPHRGs may present as enigmatic structures, especially when they are unusually large or multiple in number. Correct identification of OPHRG can prevent such diagnostic dilemma. Although the pulse granulomas occur most frequently in oral tissues, there are reports describing their occurrence beyond the oral cavity, the extraoral pulse or hyaline ring granuloma (EOPHRG). Most frequent sites for EOPHRG are lungs and gastrointestinal tract.,, Here, we have restricted our discussion to OPHRG. We have also discussed the details of its pathogenesis. 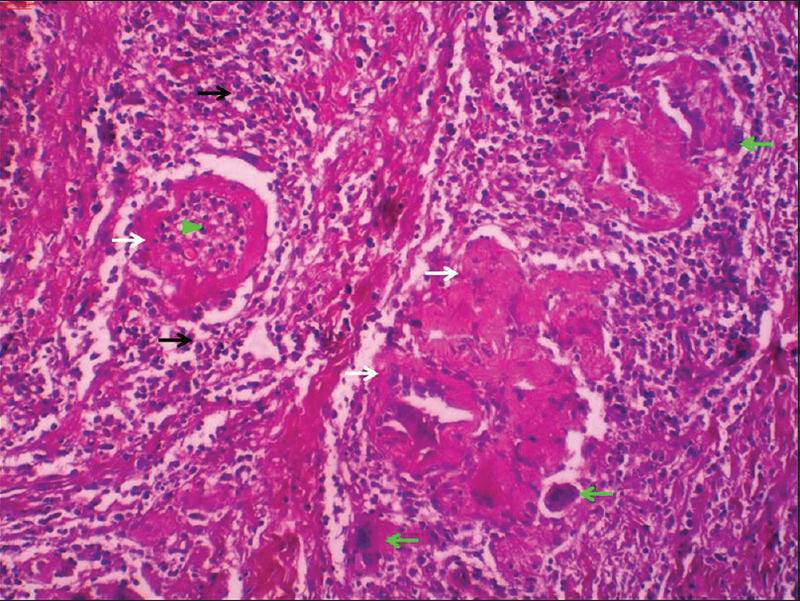 In haematoxylin- and eosin-stained sections, hyaline ring or pulse granulomas appear as rings of amorphous, pale eosinophilic material with corrugated periphery. The eosinophilic material is thought to be pooled inflammatory exudate [Figure 1] and [Figure 2]. The foreign body giant cells are drawn to the site for removal of insoluble haemosiderin granules [Figure 1] and [Figure 2]. Chronic inflammatory cells within and around the rings are usually present [Figure 1] and [Figure 2]. Necrotic debris and dystrophic calcification may also be present. 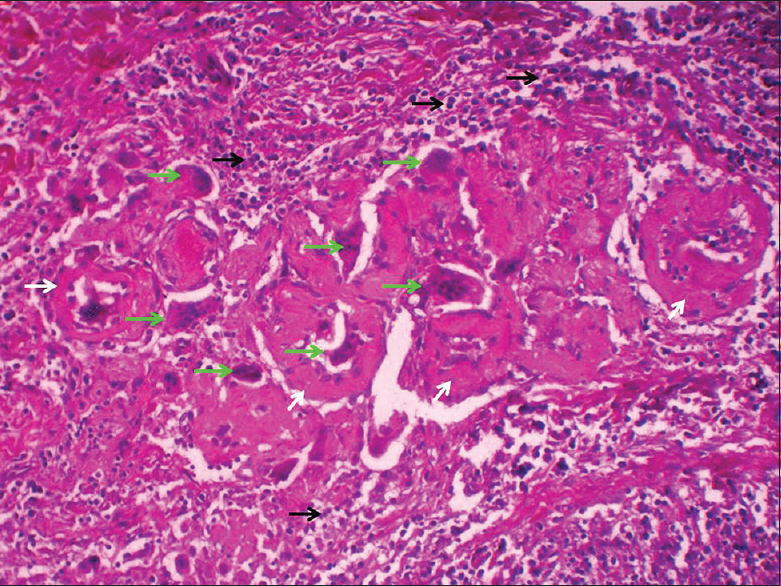 The connective tissue surrounding pulse granuloma may show fibrosis. Histopathologically, pulse or hyaline ring granuloma resembles hyaline degenerative changes in vessel walls seen in hypertension, diabetes mellitus or amyloidosis. However, this microscopic resemblance is considered more important when it is encountered in extraoral, extrapulmonary and extragastrointestinal lesions because, in oral cavity, gastrointestinal tract and lungs, the most probable aetiology of pulse granuloma is implantation (aspiration in case of lungs) of food particles. We encountered OPHRGs in chronically inflamed dental follicle of impacted mandibular third molar, which was removed due to recurrent pericoronitis. Hyaline ring granulomas were initially described by Lewars as 'chronic periostitis'. They suggested that minute food particles are pushed into the submucous connective tissue beneath the mandibular dentures. These food particles provoke a granulomatous foreign body reaction. Later, King described these structures as foreign body reaction to the fragments of pulses or edible seeds of legumes and coined the term OPHRG. Amongst two theories, the exogenous theory is the most accepted. Open carious lesion with pulp necrosis or tooth left open without interim restoration between visits of endodontic treatment may become a patent pathway for food particles to reach the periapical tissues. Opercula around the partially erupted third molars also allow the entry of food particles to periodontium. Minute food particles may also be pushed into the submucosal connective tissue of edentulous alveolar ridge due to the pressure exerted by denture. Extraction sockets and open wounds may also become passive portals of entry for foodstuffs to the tissues. Dunlap and Barker put forward an 'endogenous theory' for the development of pulse granulomas. They introduced the term 'hyaline rings'. The endogenous theory stated that hyaline rings represent hyaline degenerative changes in the walls of blood vessels initiated by acute vasculitis. This concept brought the term 'giant cell hyaline angiopathy'. The term 'hyaline bodies' is used to describe OPHRG in few reports.,, However, this terminology is more appropriate to describe hyaline bodies of Rushton, which are usually seen in the epithelial linings of inflamed odontogenic cysts. These structures are etiologically, structurally and morphologically different from OPHRG. Rushton bodies are derived from products of epithelia of odontogenic cysts, whereas OPHRGs are foci of granulomatous inflammation in response to foreign bodies. Thus, the two terminologies (hyaline bodies and hyaline rings) should not be used interchangeably to avoid confusion. OPHRG is a form of chronic granulomatous inflammatory lesion, which most probably arises due to implantation of particles of leguminous food stuff in the submucosal connective tissues. It can be encountered in any lesion of chronic inflammation, most commonly intraosseous inflammation. They should not be misinterpreted as Rushton bodies observed in epithelia of odontogenic cysts or hyaline degenerative vasculitis associated with systemic diseases to avoid diagnostic confusion. Philipsen HP, Reichart PA. Pulse or hyaline ring granuloma. Review of the literature on etiopathogenesis of oral and extraoral lesions. Clin Oral Investig 2010;14:121-8. Knoblich R. Pulmonary granulomatosis caused by vegetable particles. So-called lentil pulse pneumonia. Am Rev Respir Dis 1969;99:380-9. Stewart CJ, Hillery S. Peridiverticular colonic hyaline rings (pulse granulomas). Ann Diagn Pathol 2005;9:305-6. Lewars PH. Chronic periostitis in the mandible underneath artificial dentures. Br J Oral Surg 1971;8:264-9. Dunlap CL, Barker BF. Giant-cell hyalin angiopathy. Oral Surg Oral Med Oral Pathol 1977;44:587-91. Rannie I. Chronic mandibular periostitis associated with “vasculitis”. Pathol Microbiol (Basel) 1975;43:199-203. Yang ZP, Barnett F. Hyaline bodies and giant cells associated with a radicular cyst. Endod Dent Traumatol 1985;1:85-7. Keirby FA, Soames JV. Periostitis and osteitis associated with hyaline bodies. Br J Oral Maxillofac Surg 1985;23:346-50. Harrison JD, Martin IC. Oral vegetable granuloma: Ultrastructural and histological study. J Oral Pathol 1986;15:322-6. Shear M. The hyaline and granular bodies in dental cysts. Br Dent J 1961;110:301-7.